I grew up reading books by Margaret Wise Brown, but I was not familiar with her book, Big Red Barn. This book seems a bit different from many of her others because the illustrator, Felicia Bond, is not someone she collaborated with much in her writings. Being a simple review of barnyard animals and their sounds, along with other items common to a farm, Big Red Barn easily won the attention of all of my children. The rhymes that slip easily off the tongue, as well as the farm day’s progression from morning to night offer opportunities to teach preschoolers. Pros: A fun, easy-to-read book ripe with topics for learning, this book is a great preschool read-aloud book. 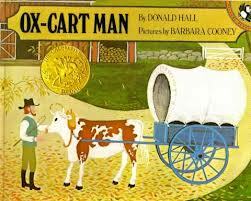 The Ox-Cart Man tells the story of a family who works throughout the year on their farm to produce a myriad of items that may be sold at market in the fall to provide for their family. The book begins at what seems to be the end of the process as the man sets out to sell the goods and even the cart and ox that he took to town. He buys a few items the family needs, then returns home to start over. The folk-art illustrations, while simple, perfectly complement this story. The clear colors, countryside scenes, and pleasant expressions on the characters’ faces give a calming sense of well-being to this story about the rhythm of the passing seasons. 1. “Excellence of execution in the artistic technique employed.” – Beautiful folk art illustrations. Simple, yet effective. 2. “Excellence of pictorial interpretation of story, theme, or concept.” – As the family’s year unfolds, the story is easily understood through the pictures. 3. “Appropriateness of style of illustration to the story, theme or concept.” –The style of the illustrations perfectly fits the storyline. 4. “Delineation of plot, theme, characters, setting, mood or information through the pictures.” – The plot, characters, setting, mood, and information are depicted so clearly through the pictures on each page that the story could nearly be understood without words at all. 5. “Excellence of presentation in recognition of a child audience.” – My girls definitely enjoyed this book. The illustrations led to great discussions about shearing sheep, spinning wool, and other old-fashioned farm tasks. 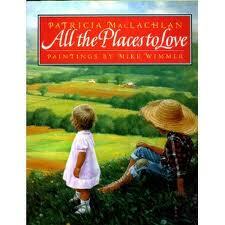 Summary: In All the Places to Love by Patricia MacLachlan, a boy nostagically connects his years with the places that he and his family loved to go. I found this book irresistible, as much for its richly detailed paintings by Mike Wimmeras for its slightly emotional story which pulls at the heartstrings on many levels. I felt as if I could walk right into each of the illustrations and feel at home. My children loved the book and seemed captivated by the art work as well. Pros: Lovely illustrations and a story that will bring back childhood memories for all. Cons: “All the Places to Love” are clearly on this family’s farm, but I hope that my children can find places to love wherever God takes them throughout their lives.